The Arctic Ocean receives huge quantities of material from the mainland via giant Arctic rivers that drain vast swathes of Eurasia and America. Climate change is causing greater quantities of water, nutrients and ancient carbon to be delivered by these rivers from land-to-ocean. How is carbon lost, or transformed, as it travels from land to the Arctic Ocean coast? How will physical and biological processes alter across estuarine and shelf systems as nutrient and carbon subsidies from land change? How will future change in freshwater supply and their associated carbon and nutrient loads influence how the coastal Arctic Ocean functions? CACOON will measure poorly understood processes at the land-ocean interface and gain unique insights into the functioning of these dynamic near-shore environments. Future projections of the impacts of coastal freshening and ancient carbon supply will be produced using numerical models. The CACOON team will head to the East Siberian Shelf Sea region and sample along two of the largest Arctic rivers – the Lena and Kolyma. This region is already reacting to rapid climate warming and the amount of freshwater delivered to the ocean from the Arctic mainland is increasing here. These rivers drain landscapes containing huge stocks of carbon, currently locked up in frozen soils and ice. This carbon – that hasn’t seen light of day for thousands of years, is starting to thaw and make its way into rivers. CACOON will study what will happen to this ancient carbon as it travels from land-to-ocean. Will it simply be transported to the coast and have little impact on the biology of the Arctic Ocean, or will it affect food webs and potentially exacerbate global climate change? 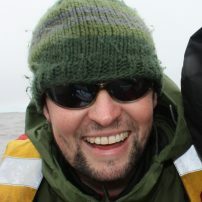 Paul Mann is senior lecturer in Biogeochemistry at the Department of Geography and Environmental Sciences, Northumbria University, and co-lead investigator of the CACOON project. Paul’s main focus is on aquatic and coastal carbon cycling in Arctic river systems, and how these will respond to future climate change. Within CACOON, Paul will aid in sample collection and geochemical analyses on the Kolyma River during transects out from the river to the coast. Jens Strauss is a scientist at the Periglacial Research Unit of the Alfred Wegener Institute Helmholtz Centre for Polar and Marine Research, Potsdam, Germany. In the CACOON project he is the co-lead investigator, and responsible for identifying permafrost thaw end-members and quantifying how inputs of ancient-organic matter to aquatic systems relate to changes in terrestrial organic matter composition. 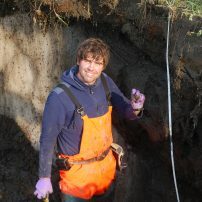 Jens has been on many Arctic field expeditions in the North American and Russian Arctic, researching the vast permafrost domain of the former Beringian land mass, which was unglaciated during the last ice age.